Some of the ways to motivate yourself include use of inspirational quotes, images, or setting deadlines. No matter what you want to, the main problem will be motivation. Whether it is exercising, leaning a new language, working, etc., the problem is always that you are never motivated enough. 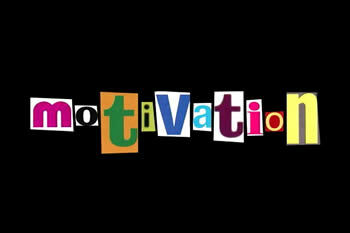 It is the lack of motivation that leads us to make excuses such there isn’t time, or that the conditions are not ideal. If we were motivated enough, these excuses would not matter. Necessity or Deadlines. Sometimes there is nothing more effective that a deadline looming on your head. This is literally the only many procrastinators motivate themselves to get anything done. Plus by having a deadline or setting yourself a deadline makes you accountable; you have to finish it before the deadline, or else. Use inspirational quotes, images, or music. There are times when you come across some words or an image or a song that really gets your blood pumping; it just makes you energetic and makes you want to move. This is the feeling that you want to hold on to and replicate when you actually want to get work done. So hold on to those words, images or music. The will help get your blood pumping when required. Bribery; what works for some people is incentives. For example, if I go to the gym for at least 3 days this week, I will reward myself with ice-cream or cake. This makes you want do the work so that you can get the reward later. Accountability. Similar to rewards, this is actually punishment. In this case, you set some parameters for yourself. Set yourself a goal, if you don’t meet that goal, then you will punish yourself by taking away something you love. For example, if I don’t go to the gym at least 3 days this week, I will stop watching TV for a week. This motivates you through fear, which works for some people. The fear of losing something you love makes you work harder so you don’t. Create Momentum. Win battles before wars. Don’t tackle a huge task all at once. Instead break it down into smaller tasks. Smaller tasks are easier to manage and you are less likely to feel overwhelmed. Also, knowing that you have finished a task leads to a sense of satisfaction and motivates to undertake another. Make it fun. There is no question that most of the tasks on the to-do list are not fun. In fact they are so dreary that we want to put them off indefinitely. In order to make you want to tackle them, make them fun, or turn them into a little competition with your friends or colleagues. Perhaps the last one to finish the task gives all the others a treat. Take a break. Sometimes you just can’t motivate yourself, no matter what you try. This is a case of burnout. If nothing works, then perhaps you should stop forcing it. Instead take a break, do something you love, rejuvenate, and then come back to the task well rested and hopefully ready to work. And last but not least don’t be hard on yourself. It is ok if your motivation falls short today, and you don’t accomplish the task you set out to do today. It’s OK. Don’t give up. Take a breather, and come back to fight tomorrow. This war never ends, but you’ll win some battles and lose other. The important thing is that you win at least one battle more than you lose. Then you are on the right track.